Well here I am again. Another month has rolled around. I want to try and reach a subscriber who has written to me telling me that he is not receiving e-mails about the articles. This is for Bill W. I clicked on Reply to respond to your e-mail and I sent my response to you and it bounced right back. I even tried sending it from a different e-mail address and it still bounced back. So you must not have me on your safe sender list and your server is rejecting my e-mails. I have no other way to address this. Ok, now that is out of the way. It gets warmer here and then it goes right back to cold again. Having said that, the flowers are blooming and the peepers are peeping, the grass is beginning to turn green and leaves are appearing on the trees, so regardless of the temperatures, Spring is definitely in the process of springing. I am excited to get back outside again! It seems like it has been a very long winter to me. Speaking of winter, I got through it without a hitch until last week when I caught the flu or some other nasty bug. It always amazes me how quickly one of those nasty germs can lay you low. Thankfully, I must have a good constitution and have bounced back from it. Please remember those less fortunate than yourselves and be kind to one another until next time. If you have a few e-mail accounts, your folder pane can quickly become very crowded, making you waste precious time trying to navigate to that particular folder that you need and use a lot. There is a solution for this problem and that is – make any folder you like a favorite! It will then appear at the top of your folder pane and very easy to find! 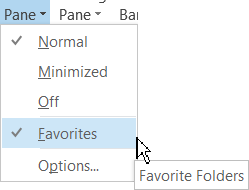 If the Favorites area does not appear, switch to Mail and click View | Folder Pane | Favorites. You can now add any folder to your Favorites by right-clicking it in your Folder pane and click Show in Favorites. Bonus – you can even set a Search Folder to be a Favorite so it is easy to find and use! Did you know that aside from having the ability to link information from one Windows application into your Word documents, you can link other word documents to your current document? Well you can and it can really come in handy with you are working with a document that needs information from other documents, such as, perhaps you have a contract that has boilerplate clauses in it. Those clauses may be stored in another document. You can then pull them into your current document when you need them. Place your cursor where you would like the document to be inserted and linked. Click the Insert tab of your Ribbon. In the Text group, click the down-arrow next to the Object tool to display choices. Click Text from the File to display the dialog box. Specify a file name for the document you would like inserted and linked. Click on the drop-down arrow at the right-hand side of the Insert button to display a menu of different ways you can insert the document. Select Insert As Link from document from the menu. The process will result in Word displaying the other file but the INCLUDETEXT field is used instead of the actual text from the file. The advantage of adding links in this manner instead of inserting the other file completely, is that the original documents (the ones you are linked to) can be independently updated and those changes are then reflected in your document with the links. Of course, this depends on whether you update the links in your document by selecting the link and clicking F9.